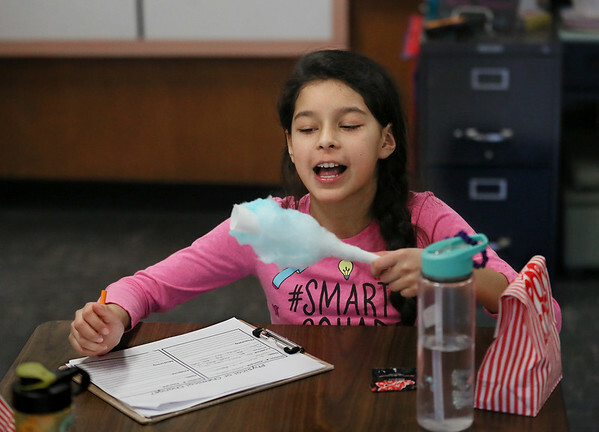 Fifth-grader Belayah Velasquez tastes cotton candy during a "Chemist's Carnival" Friday at Beeman Elementary School in Gloucester. Students in all three fifth grade classes took part in the event to celebrate the successful completion of a physical science unit on the structure and properties of matter. The children visited a series of stations to watch the making of a number of carnival treats, including popcorn, snow cones, cotton candy, hot dogs and lemonade. They were then tasked with determining whether the food preparation involved a chemical reaction or a simple non-chemical change in the state of the matter making up the food. They had to justify each opinion with a scientific explanation. Along the way, the children enjoyed a modest portion of each treat.